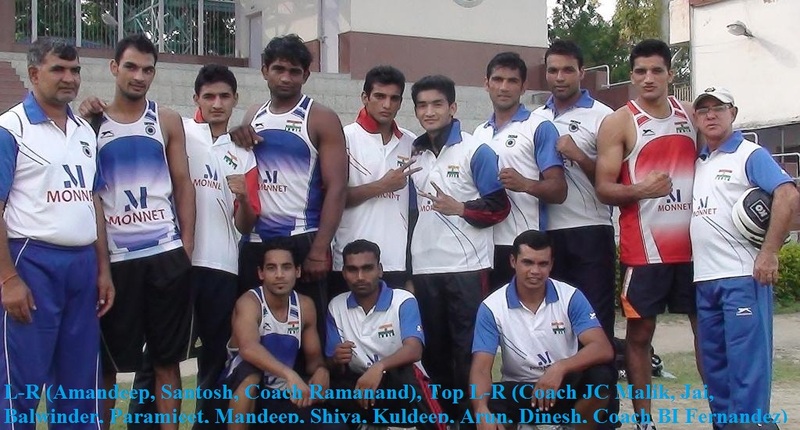 The ten member team selected to represent India at the 2011 ASBC Asian Confederation Boxing Championships were making last minute preparations at the Karnail Singh Stadium in New Delhi, as team geared up to leave for the for the harbour city of Incheon in South Korea on Tuesday. The biennial event to be held from August 3-13, 2011 will witness over 150 boxers from 24 Asian countries vying for top honours. Among all the participating countries China, India, Iran, Kazakhstan, Mongolia, Uzbekistan and Korea, the hosting national federation will be represented in the Continental Championships in all the weight categories. The XXVI edition of the championships will sever as a preparatory ground for the first qualifying event for 2012 London Olympics, the 2011 AIBA World Boxing Championships, which slated to be held in September this year at Baku, Azerbaijan (September 22-October 10). BI Fernandez, the Cuban expert, who has been with the Indian boxing team since 1990, considers this tournament to be instrumental especially with the Olympic qualifying events beginning in September and said the championship will also give India an opportunity to access the level of competition that Asia offers. He expressed, “It is the Continental Championship and we might face tough competition from countries like Kazakhstan, Uzbekistan, Tajikistan and even Chin, moreover the event will be a good exposure for our boys and it will allow us to further assess our pugilists”. The previous edition of the tournament was held in Zhuhai, China, where India bagged 7 medals (1 gold, 2 silver and 4 bronze). Talking about our chances this time around, the foreign coach expressed, “See a lot depends on the draw, but I am sure we will return with a favourable performance”. Olympian and Asian Games silver medallist Dinesh Kumar (81kg) will lead the Indian charge in Incheon along with Paramjeet Samota (+91kg) a gold medallist at the Commonwealth Games and a bronze medallist Asian Games. Dinesh who won a bronze at the 2009 at Zhuhai, China is looking to better his record at the Asian Championship. “We have been training hard at the camp in Patiala and I have been focusing on a more attacking strategy, especially after the introduction of the new scoring structure. I confident, well prepared and should be able to better my performance”, expressed the 22 year old. Samota, who’s had a good year so far with a gold medal at “Belgrade Winner” an international boxing tournament in Belgrade, Serbia along with the best boxer award and a bronze in Cuba at the Giraldo Córdova Cardin tournament, is looking to carry on the good from. The 23 year old says, “Everyone is looking to secure an Olympic berth and so am I, a good performance here will be big boost and help my cause”.2010 Commonwealth Games bronze medallists, Amandeep Singh (49kg) and Jai Bhagwan (60kg) will also be seen in action at the Asian Championships. Playing their second international tournament this year, both the boxers aiming to get more exposure and match practice under his belt via this event. Services boxer Santosh Harijan (52kg) and Shiva Thapa (56kg) have also had favourable performances this year. While Shiva won gold at the “Belgrade Winner” in Serbia, Santosh has two bronze medals to his name – one at international tourney in Kazakhstan and the other in Cuba. Santosh, who lost in the quarter-finals of the 21st President’s Cup Boxing Tournament in Indonesia, said he has worked on his weaknesses and is looking in better shape. He stated“We have been doing a lot of endurance training because with the new scoring system you need to go all out in the final round. I have learnt from my mistakes in Indonesia and will certainly come back with a good result”.